The fact that many secular scientists as well as biblical creationists reject the Big Bang should give people reason to pause and reflect. Instead, people keep believing the pronouncements of secular scientists and Bible compromisers affirming the failed Big Bang conjecture. Indeed, under-investigated findings are touted as the "smoking gun" for the Big Bang, but indicate desperation to cling to a universe without a Creator. I think that is why the Big Bang won't die gracefully: People won't let it because they don't want to admit that God is the Creator and makes the rules. 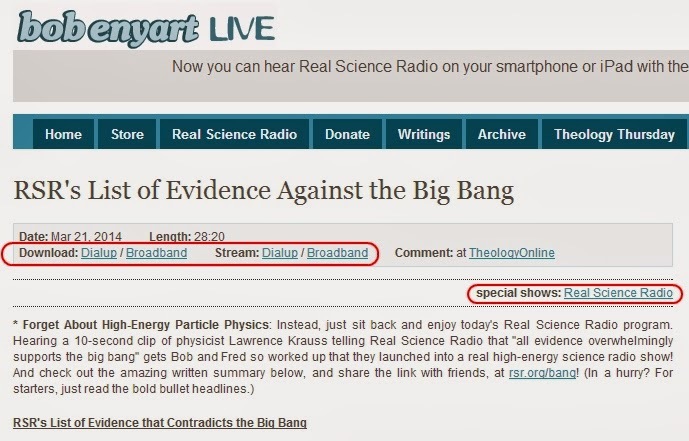 Bob Enyart and Fred Williams on Real Science Radio discuss evidence refuting the Big Bang, including how Laurence Krauss made untrue statements. You can listen to the audio online or through downloading, but pay attention to the page because there is a wealth of information and links. This should be the equivalent of driving a stake through the Big Bang's heart, shooting it with a silver bullet, pouring salt in its mouth and sewing its lips together — but that ol' evolutionary black magicks of wishful thinking and bad logic just keep bringing the Big Bang back to life. Click here for "RSR's List of Evidence Against the Big Bang".